Timing belts are crucial to the proper functioning of engines that use cams to operate cylinder valves. A timing belt turns the engine’s camshaft, which helps move the open and close cylinder valves that bring air and fuel into the cylinder heads and pull exhaust gases out. In some engine designs, the timing belt may also be used to drive other engine components, such as the water pump and oil pump. While timing chains and gears may be more durable, rubber composite belts are quieter in their operation, are less expensive and are more efficient, when compared with a gear or chain system. Also, timing belts do not require lubrication, which is essential with a timing chain or gears. However, rubber composites break more easily than gears and chains. Therefore, it is critical to replace your timing belt BEFORE they break. A broken timing belt can damage your engine, and in some cases a broken belt will cause your engine to suddenly stop running-without warning. Which is why timing belts require periodic replacement in order for your engine to run properly. Replacement usually varies by the make and model of your car. Generally, vehicles built in the 1990’s, and equipped with timing belts, have recommendations in the owner’s manuals to have them replaced every 60,000-90,000 miles. Newer vehicles built after 2000 recommend timing belt replacement every 105,000 miles. 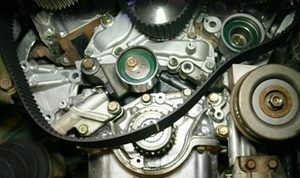 Engines that use timing belts have two different basic engineering designs: an interference type and a noninterference type. If a timing belt in an interference engine breaks, it will likely damage internal engine parts-valves, lifter cams, etc.. If the timing belt in a noninterference engine breaks, the engine will cease running but will not cause internal damage. We will check your OEM (Original Equipment Manufacturer) service data for the type (interference or non-interference engines), and mileage intervals for timing belt replacement. Or, read more about timing belt problems.